We built Storyblok with a robust and flexible plugin system to give our customers the power to extend the editor with custom fields like a color picker or a google maps location selector. It’s basically a Vue.js 2.5.2 component extended with a few helpers in the ‘window.Storyblok.plugin’ variable. initWith: Should be used to define the initial data of the plugin. pluginCreated: Should be used to initialize the plugin. Examples: Load data from Storyblok or external sources, Load and initialize a WYSIWYG editor. In the $sb variable are stored commonly used helper functions. This method can be called to get external scripts. Proxy components are Vue.js components which you can use in your custom field-type for user inputs that require access to the management API. Do you have an idea for a proxy component? Just talk with us at the live chat to request one. How to call the Storyblok API? In fieldtypes, you can use ‘this.api’ to get access to the Storyblok delivery api. For example, you can use it to build a selectbox of stories. To pass options that are configurable in the schema definition define the option keys in the ‘Input’ box. The values will be available in the ‘this.options’ object. How to use the field type plugin? 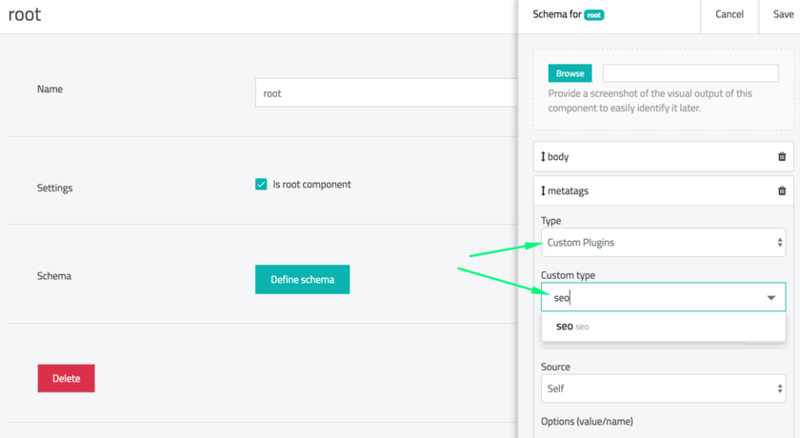 After creating the plugin, you can define it in the schema configuration of your components. Choose ‘Custom Plugins’ as the type and search for your plugin. If you want to create more complex plugins you have also the option to develop a plugin with a local dev environment using your favorite editor. This let’s you load other plugins and organize your code in multiple files. 1. Start by cloning the field-type repository and run the dev server. This will spin up a server on http://localhost:8080. 2. 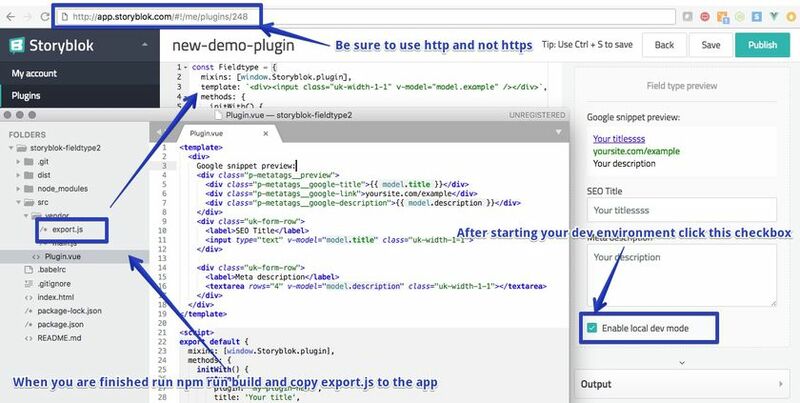 Next you need to change the url of the Storyblok app from https://app.storyblok.com to http://app.storyblok.com as your local environment runs on http. 3. Open the file Plugin.vue and change the plugin name in the initWith method to the one you created in Storyblok. 4. Now you can click the checkbox “Enable local dev mode” to load your local environment into the field-type preview and start developing your plugin. 5. 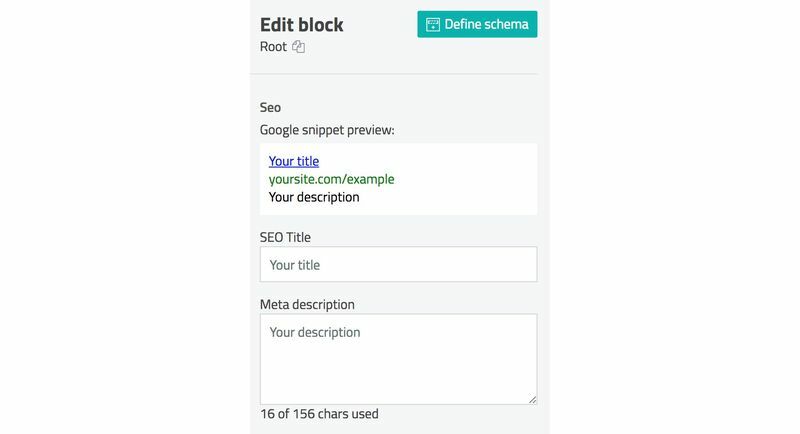 When you finished developing your plugin you need to run npm run build and copy the content of the file src/vendor/export.js into the editor text field of the Storyblok app and click the publish button.